NOTE: See bottom of this page for information on the numerous versions of the DeArmond Model 2000/Dynasonic guitar pickup currently available. The DeArmond Model 2000 pickup, introduced in the late 1940s, was the first guitar pickup with six individually adjustable pole-pieces. The clever design enabled the height of each individual pole to be easily adjusted using a screwdriver, without disassembly or removal of any parts, or loosening the strings. This pickup was available in one height only, (the neck version) until some point between 1957 and 1961, when a taller bridge version was introduced. Model 2000-B Guitar pickup, original version, neck position. Metal frame height is 7/16″ ( 11 mm.) from flange to top of pickup. The first picture shows the six magnetic pole-pieces and the six screws for adjusting the poles’ height. The second picture shows the underside of the pickup, with the brass rings crimped to the ends of the pole-pieces and the six screws threaded into the brass rings. Finish options were chrome with black coil former or gold-plated with white coil former. Gretsch was the first guitar manufacturer to offer this pickup as standard, and referred to them in their literature as ‘Gretsch-Dynasonic’ and ‘Dynasonic Fidela-Tone’. This pickup has been accurately reproduced in recent years by Seymour Duncan, who refers to is as the ‘Dynasonic’. The black coil former above, from an early Model 2000 pickup, shows the pole-piece height adjustment screws in line with the pole-pieces, and therefore the strings. These two different pickups, one on the left, a standard Model 2000 and the other on the right, a variation with a white coil former with no visible top fixing screws, are shown fitted in a Premier Bantam De Luxe guitar. Three other companies, CF Martin, Kustom and Standel, specified cosmetic alterations to the Model 2000’s brass housing. Where the original model 2000 had a rectangular top ope, Kustom’s version had a trapezoidal ope, and CF Martin’s had an irregular ope, all as shown below. CF Martin fitted this version with an irregular ope in their flat-tops. The 00-18E had one pickup, while the D-18E and D-28E had two each. Note the two different locations for the bridge pickups in the first and third photos above. CF Martin’s F series of electric archtops were fitted with a neck and bridge-mounting pickup, again with the same distinctive front ope. The F-50 had one pickup at the neck. The F-55 and F-65 had two pickups each. (A0029 Photo copyright Hadley Kenslow). This pickup was fitted into the Standel 510-S guitar, in a black/white bezel. This pickup was fitted in Ovation’s Thunderhead guitar, produced as part of their Electric Storm series of F-hole archtop guitars. While this pickup is not dimensionally the same as the others above, the view of the underside clearly shows it’s lineage. All of the Electric Storm series pickups for guitar and bass were provided with the same ornate molded black plastic bezel. This pickup was patented by James H. Rickard on October 27, 1970 under Patent No. 3,535,968, assigned to the Kaman Corporation, manufacturers of Ovation musical Instruments. DeArmond’s Model 2000 guitar pickup – also known as the the Dynasonic – has been the subject of much debate since Fender introduced their excellent range of DeArmond guitars in the late 1990s. Some of these guitars were fitted with pickups which were intentionally quite similar in appearance and size to the original Model 2000, but with a different internal structure and resultant tone, and referred to as the 2K. Somewhere along the way, DeArmond’s original pickup was referred to as the 200, and this incorrect name stuck. 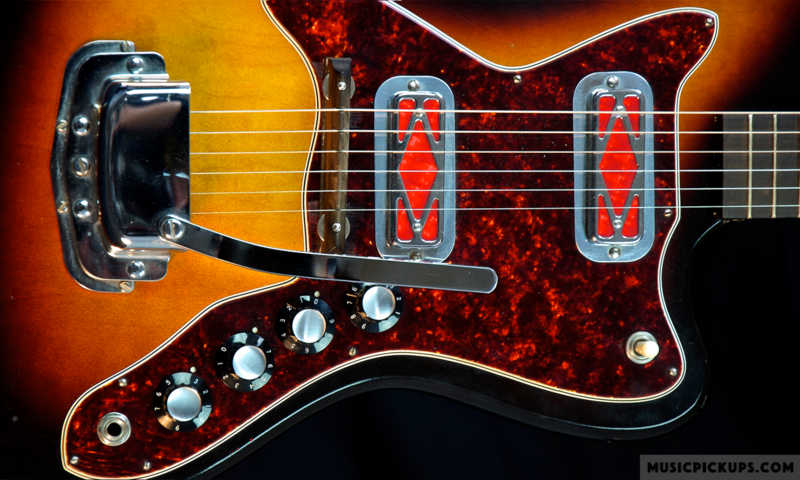 This situation has been made more confusing by the introduction of three more Model 2000 replica pickups – this time constructed in the same way as the original – by Seymour Duncan, Gretsch and TV Jones. The differences between each of these pickups will be shown in greater detail in the near future. To begin this exercise, see an extract from DeArmond’s 1965 catalog below, clearly showing the original pickup – the Model 2000. This is Fender’s Model 2K pickup. While the upper, normally visible part of the pickup is very similar in appearance to DeArmond’s Model 2000, the underside is very different. ‘DeArmond’ is engraved into one end of this pickup and is visible when installed in an instrument. ‘Rowe Industries’ is stamped on the underside of the coil former on DeArmond’s Model 2000. Fender’s pickup uses one flat bar magnet positioned on each side of the poles, creating a similar magnetic field path to Gibson’s P-90 pickup. Gretch’s version of the model 2000. The top of the pickup looks just like the original DeArmond version. The underside of the pickup does not have Rowe Industries stamped into the coil former. Also, the interior of the metal casing shows a sharp edge, suggesting that it is a casting, whereas the original casing was pressed brass. The Seymour Duncan version of the original Model 2000 uses a pressed brass casing as the original and is available in a umber of options. TV Jones also produces a version which closely resembles the original Model 2000.